When is a room not always a room? A home’s mudroom might involve a separate smaller room near an entrance or be combined into a laundry room. Then again, it may also just be a space in the hall of a home’s entryway. However it’s being defined or used, all mudrooms have a common purpose – to act as a functional transition space between your home’s inside and the outdoors. There are lots of useful features a mudroom’s design can incorporate. So what mudroom ideas work best? Let’s look at nine of the most popular features available for mudrooms. Tracked-in mud and dirt can wreak havoc on your rugs, carpets, tiles, or hardwood at any time of the year. Add slush, snow, and salt during the winter and spring into the mix of potential messes your house has to contend with and the benefits of a mudroom become even more obvious. The “mudroom” name itself declares one of its main purposes – to keep mud and other cleanups-waiting-to-happen contained and isolated. Along with using boot trays during certain times of the year, additional shoe storage solutions help keep footwear organized in your mudroom. Shoe racks make it easier to manage footwear storage and save you from wasting time looking for a misplaced boot, running shoe, or heel. Another of the mudroom ideas you can use to keep your mudroom tidy is by storing footwear in cubby dividers. Just remember to let your shoes and boots properly dry out before storing them there. You’ll also want to make sure you’re only keeping footwear in your mudroom that’s relevant to the current season. This minimizes clutter and makes it easier to maintain the space. Removing a closet‘s doors and adding a bench adds multi-purpose, open concept storage to a mudroom. Does the entryway you’re planning to use for your mudroom have a closet? If so, Organized Interiors can refresh its look and functionality by completely transforming the closet space. We can accomplish this by removing the closet doors, adding a built-in bench with storage space, and adding hooks, cubbies, and shelving. An open concept closet makes access to your belongings that much easier and convenient. Mudrooms are typically known to be unflashy, hard-working areas of the home, so this is one of the mudroom ideas you can use to inject a stylish touch to your space. Even if you don’t have an entryway closet to convert, a dual-purpose bench can be added to your mudroom. In fact, most mudroom owners would say they’re almost essential. There’s a reason benches have been one of most popular mudroom ideas and features for many years! A mudroom bench provides a convenient sitting area for putting on and taking off your footwear. It also saves your walls from the scuffs and wear that come from using walls as support when putting on shoes and boots. Along with footwear, jackets and coats will be the other main occupants in your mudroom’s storage space. You can store them on hooks or a coat rack, depending on what your space allows and your personal preference is. Be mindful of where you’re storing wet items and give them space to dry out. Even more so than footwear, you’ll make life easier for yourself by only storing coats and jackets in your mudroom that are seasonally relevant. Winter jackets, in particular, are longer and bulkier. They serve no purpose taking up space in a mudroom during the middle of summer. Perhaps you have a room in your home that you’re considering for a mudroom. The only problem is that it may be more space than you require for the specific “comings and goings” and outerwear storage purposes that mudrooms primarily fulfill. Utilize that room’s extra space by adding high quality custom cabinetry to it. You’ll gain lots of valuable extra storage room for everything from cleaning supplies, to out-of-season clothing, to pet supplies, to anything else you need storage room for. 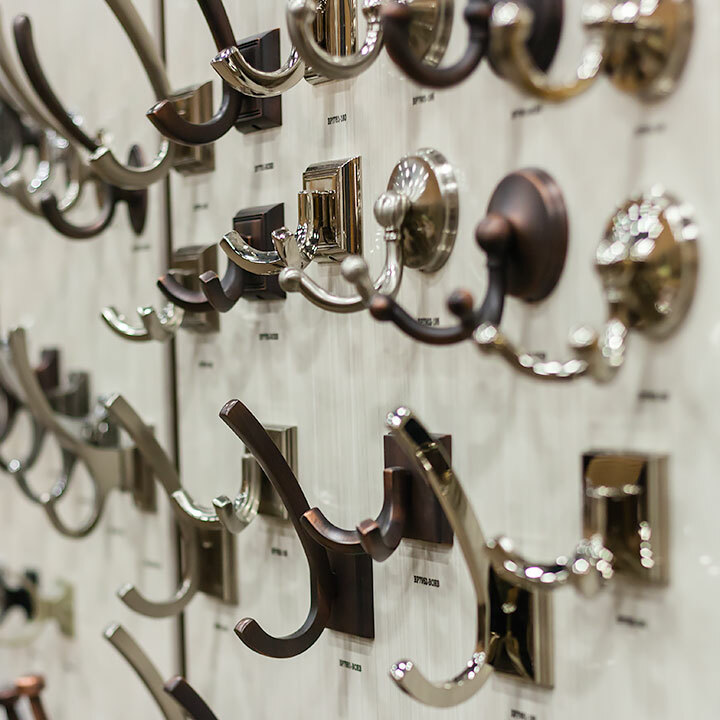 Browse through the hundreds of hooks and other types of decorative hardware available in our showroom. A high traffic area located right at a doorway is going to get dirty, no matter what. By choosing sensible mudroom ideas that anticipate problems (like messy floors), you’ll minimize future headaches. This includes choosing the right type of paint to use on your mudroom’s walls. Pick a low-maintenance wall paint that wipes down easily without rubbing away the finish. A satin, eggshell, or semi-gloss paint are generally recommended for mudroom walls. Another option to minimize mudroom wall maintenance is to install wainscotting or beadboard. It’s also very easy to clean and the wood appearance can add a warmer, rustic look to your mudroom. Choose mudroom ideas that both make it easy for your kids and encourage them to keep this area of your home organized. Have personalized hooks, cubbies, or other storage spaces for each child to store their jackets, shoes, baseball caps, and other clothing items. Backpacks and sports equipment like soccer cleats and balls, basketballs, baseball gloves, and skateboards can all have their own homes as well. Personalized storage spaces will hopefully foster an ownership mentality and good organization habits within your children towards the space their belongings occupy in the mudroom. A mudroom can be much more than an just an easy “drop zone” spot where items are dumped as soon as someone enters your home. Smart design choices will transcend your mudroom beyond the “clutter magnet” space that these areas can turn into without the proper care or forethought. And your mudroom’s design can also complement your home’s décor in the process. Discover how these mudroom ideas can improve your home by booking a free in-home design consultation with us today! The mudroom is a hard-working transition space in our homes that takes us from the outdoors to indoors and vice versa. It’s time to tune up the space that weathers all the storms. Is there room for all your coats, outerwear, or jackets? If you’re running out of hanging hooks in your mudroom it may be time to cull the herd of off-season coats. Before you do, check the pockets and look for signs of damage or wear. Take the coats to the cleaners for cleaning and repairs before storing (elsewhere) until needed when the seasons change. In every family for every pair of feet there is at least one pair of shoes. Clean and store out of season footwear until the cold weather returns. Empty paper towel rolls inserted into boots help them retain their shape. A bin with a lid may be helpful if they are stored in a dusty environment, otherwise keep the bin open and store in cool dry place. What about what’s under the footwear? From salt to mud to water and sand, whatever your footwear goes through so does your floor. That hard-working floor mat you’ve used all winter needs a shake out and placed into storage or discarded. Think about replacing it with a colourful floor mat designed for indoor and outdoor use. There are great styles and sizes to choose from. It’s a great way to inexpensively dress the space. If you don’t need it, clean it and store it somewhere else. Keep your open storage available for this season’s use. In fact, think about what you really need close at hand. Umbrellas should be stored standing in a waterproof container, handles up; hats can be stored on open shelves or on hooks, but try to edit the selection to only what you wear daily. Use bins and baskets to keep everything neatly contained. Are your walls taking a beating? With all the activities and abuse a mudroom sustains you may want to bring in some reinforcements. Consider having your mudroom outfitted with a professional touch. Organized Interiors specializes in finishes that are low maintenance, custom-sized to your space and for your families’ needs. Contact one of the design consultants at Organized Interiors to find out how you can transform the entryway to your home. Front door closets can be tricky to organize – especially when you have large coats, shoes, sports equipment and more household items that need to be stored. If you’re having a hard time keeping your closet tidy (and resorting to stuffing everything into one chaotic pile), try out some of these handy organization tips. Combine your hanging rod with shelving to accommodate for more than just coats. Instead of throwing all of your shoes on the closet floor, keep them tidy with a shoe organizer. There are various kinds of shoe organizers you can choose from, including hanging organizers and shoe racks. This will make it easier for everyone in the family to find their shoes in the morning. 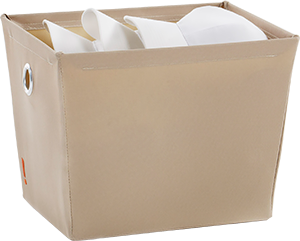 Storage boxes are an easy way to prevent your closet from looking cluttered and allow you to sort and categorize items to keep everything organized. In the winter, why hang your spring and fall coats in the entryway closet? If you have space somewhere else (such as the basement or attic), store items and seasonal clothes you don’t need elsewhere to keep your closet tidy and functional. 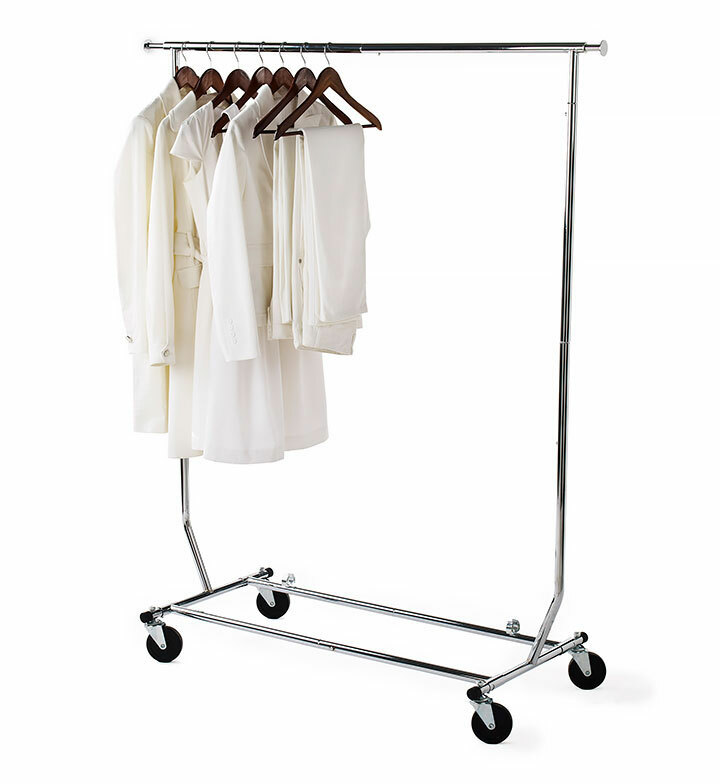 Ask about garment racks available at Organized Interiors. 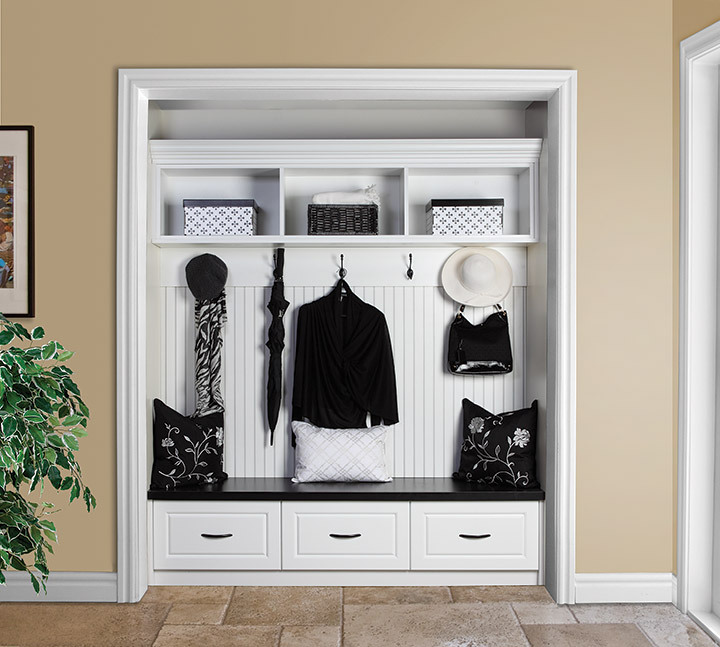 Invest in a custom mudroom closet to keep your entryway always organized. The experts at Organized Interiors are skilled in transforming closet spaces to match your needs and space. With a custom solution, you can have your closet doors removed, add a built-in bench and turn an ordinary closet into a stylish storage area. If a custom solution sounds like the right plan for your entryway, request a free in-home design consultation with Organized Interiors. Today’s urban mudroom is typically a transition space between the outdoors and in. Even with a proper closet with doors to hide the clutter, this whole “landing space” takes the brunt of a family’s lifestyle, especially as seasons change. In a typical Canadian autumn we can experience everything from summer heat to winter cold in the same week! So sweaters and jackets seem to multiply on top of summer sports gear, outerwear and footwear. In fact, you can judge a person’s level of denial, that summer ended, by simply looking at this transitional space. The good news is summer will return. The bad news? It’s time to put your toys away. Containing the clutter isn’t the problem. There are as many different types of containers as there are things to put in them but they may not be helping you stay organized. Baskets, solid coloured plastic, or windowless containers with lids, sitting on a shelf overhead are the least helpful. If you’re hunting for just a pair of gloves, you may have to rifle through several containers before you find the right one. Storage containers are great for the things you put away each season in the garage, attic or basement. Labelled boxes and containers make it easy to find items you’ve put away for long periods of time. For everyday use, use open storage containers that will help you save time. Raised, individualized cubbies that hold one pair of shoes or boots, gloves or mittens, within easy reach will help reduce clutter but remain accessible. Compartmentalizing and personalizing each space invites kids to participate in the daily rituals of keeping their clutter, under control. Customize mudroom storage solutions to work for your family. Keep in mind height considerations. Small children can’t easily reach to hang up jackets or coats on a standard clothing rod in a closet. Put up sturdy hooks within reach for each child. Add a cubby above for hats and mitts, and a shelf below for shoes and boots. This one is complicated. There isn’t one solution for all sports equipment but if your main entry is your main “landing space”, try to keep the stuff that smells as far away as possible. The last thing you want is a mudroom that smells like a hockey dressing room. Tall objects like hockey sticks can go in tall, sturdy containers or simply place them in a closet. Don’t leave them in the hallway where the sticks can mark up your walls and fall over. Non-bulky gear like baseball gloves, tennis rackets footballs and basketballs can be stored in the cubbies or packed away in the garage until spring. Think about wet coats and wet boots. Along with a functional space, make sure the finishes in your mudroom can withstand heat, cold and moisture. Customized solutions allow air-drying and water-resistant, washable finishes. Keep the mud away and enjoy the season in a clutter-free, organized home. You might call it the “mudroom,” but that doesn’t mean the entryway has to be dirty and unkempt. When guests walk into your home, the mudroom is often the area they’ll see first. Keep it organized and ready to impress with these great mudroom ideas. Some mudrooms are used just to store coats and shoes. Others are more elaborate and could include laundry, pet bowls, outdoor equipment and more. Before you determine the best way to store your stuff, determine what stuff actually will be put away. This will help you design a mudroom that makes sense for your needs. Custom storage allows you to maximize your space and design the best possible solution to keep your home organized, spacious and stylish. The closet in your entryway could be redesigned with a built-in bench, cabinets and hooks. If you need to organize the mudroom without taking up floor space, custom cabinets or shelves would work well. Canada is a four-season country and, more than likely, you won’t be wearing the same jacket all year long. 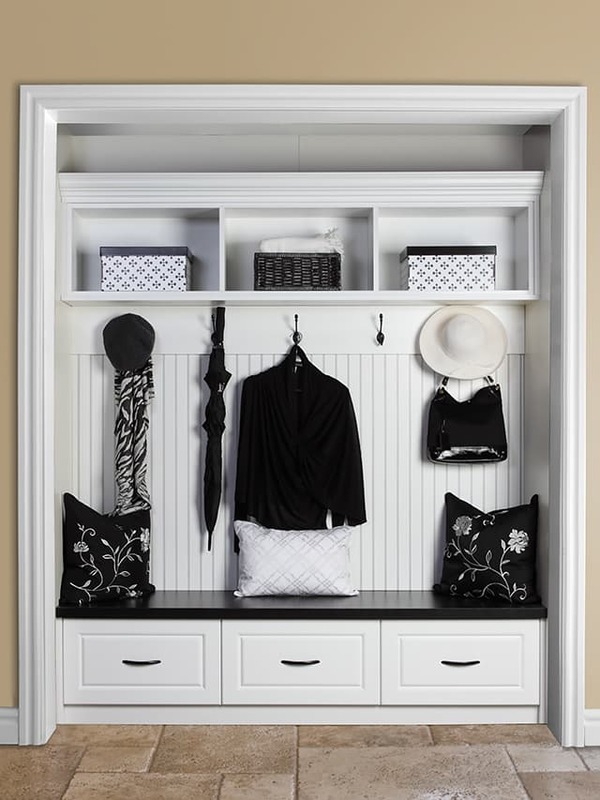 If you have a smaller mudroom, only use it to store outerwear that is seasonally appropriate. In the summer, pack up your winter coats and accessories and keep your rain jacket and umbrella in the mudroom, where it will be easy to access. If you have a bare wall, why take up precious floor space to store your stuff? With custom storage, you can use wall space to your advantage. Consider hooks, shelves, cabinets or a combination of all three, depending on your needs. Okay, this might not be an organizational tip. It is, however, a good idea if you want to keep your mudroom stylish and tidy. Search for a stain-resistant rug that can handle high-traffic areas. Don’t let a cluttered mudroom greet your guests. Use these organization tips and ideas to design a mudroom that is both functional and stylish.